Wordless Wednesday-- He's Makin' Eyes at Me! Click photo to view full size. More Wordless Wednesday. wow, the two of then so close seems odd. great capture! It does look like they're having a stand-off of sorts. I hope the chippie can get all of that into his cheek pouches. If not, the bird will certainly make off with the rest. Caite-- Not only that, but the jays always deferred to the squirrels. There must be a story behind that, but none of 'em were talking! Kathy-- Not really. 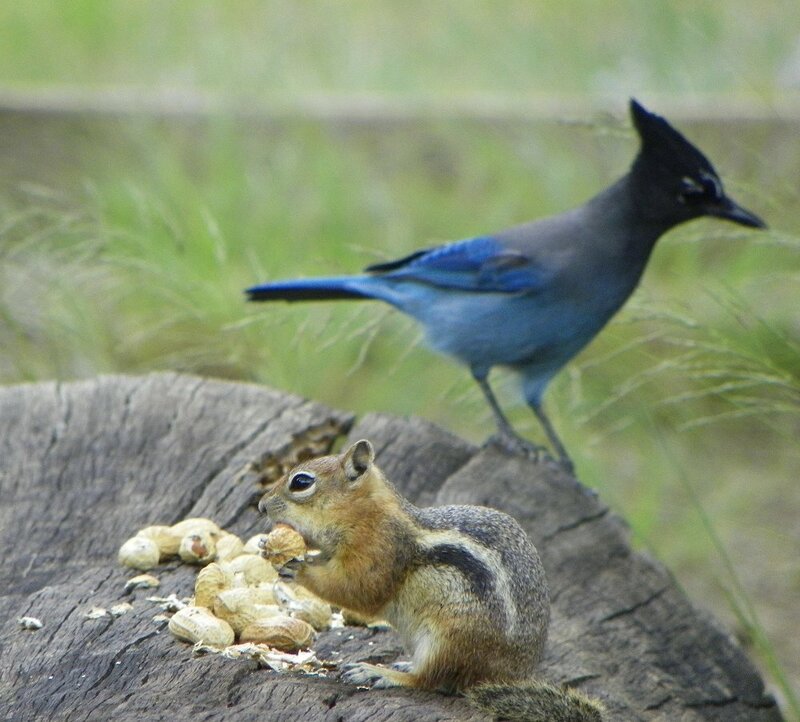 For the most part, the jays waited patiently for the squirrels to move on. Barbara-- The squirrel and the jay were both loaded down to the gunwales by the time we'd finished with them! That looks downright serene. In my yard the Jays scare everyone else away with their calls. And those that don't move get pecked and poked. Love it! Pretty impressive that you caught them together. Leslie-- That's the type pf jay behavior that I'm used to, so I was shocked to watch these Stellar's Jays wait patiently for the squirrels to finish before they moved in! SuziQ-- It wasn't that impressive, really. There were furred and feathered little piggies queue-ing up everywhere for our peanuts and sunflower seeds!